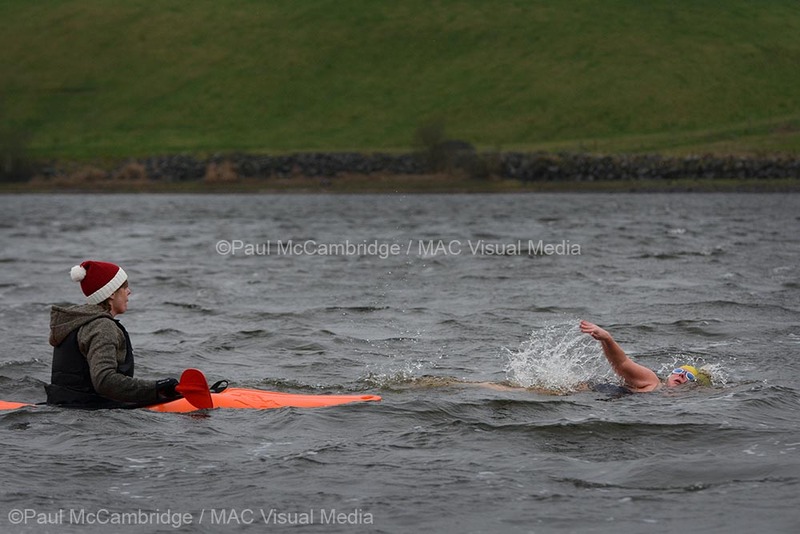 Today, a choppy and windy swim was followed by me, and each swimmer, being bundled into a warm, wood-panelled cabin. A hot towel was thrown around my shoulders and a cosy fire burning in the stove, what a treat! I was soon comfortable, hugging my hot water bottle and sadly contemplating braving the outside world again, just a few minutes more though. It was a rude introduction into todays’ swim. I usually take my time, walk in slowly and huff and puff before I’ll even get my hands wet but, with the boys all striding with purpose down the carpeted slipway and launching themselves straight in, I felt a little rushed. So, not wanting to be left behind, I walked further and faster than usual, then promptly fell off the end of the runway! Nothing for it but to swim on and do my puffing as I swam, with the first pink buoy teasingly bobbing on the waves, chuckling as I approached and the added menace of a leaky goggle. In all fairness, the kayakers were on the ball, as one came racing over to me I quickly shouted “It’s the goggles!” before I would be whipped out to safety. 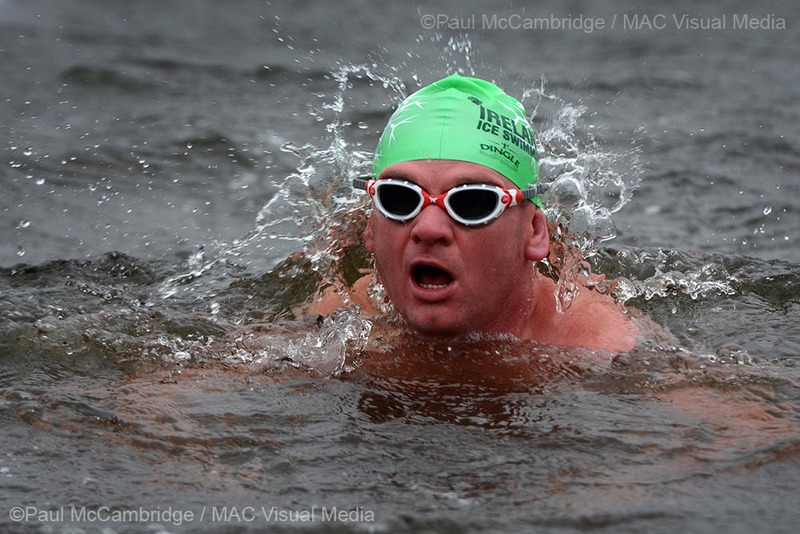 I enjoy choppy water but today felt colder than the last time I was in – yet it was a degree milder – that’s the wind-chill effect. I’m sure not the effect of Friday evenings Christmas celebrations! Honest, I only had hot chocolate last night and then early to bed. As ever at Camlough, there was a wealth of happy supporters, spirits were high and the atmosphere was buzzing, so much so that David couldn’t resist an impromptu dip! 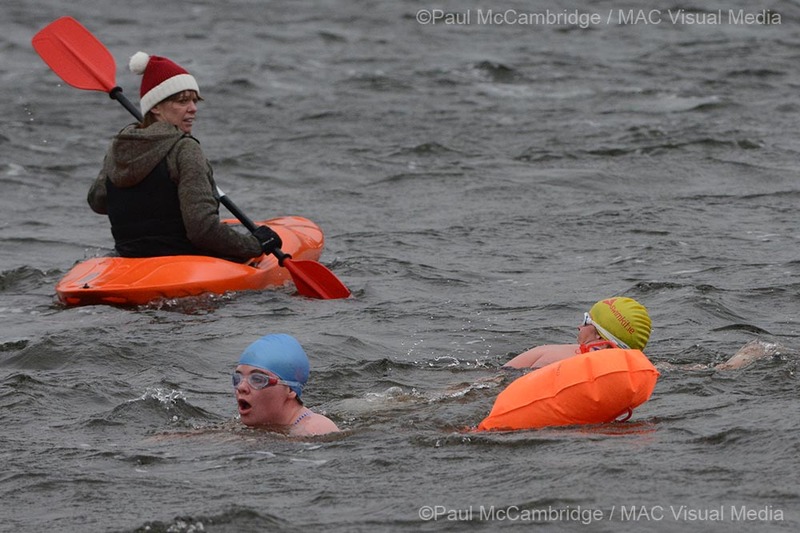 And thanks to all the Ice swim volunteers, it’s so good to be welcomed by so many friendly faces encouraging and helping – you all know what it feels like and those of us swimming really appreciate your time and effort. …and Safe Swimming to one and all! As I stood and looked out on the evening calm the air stirred and breathed in my ear, everything was still. 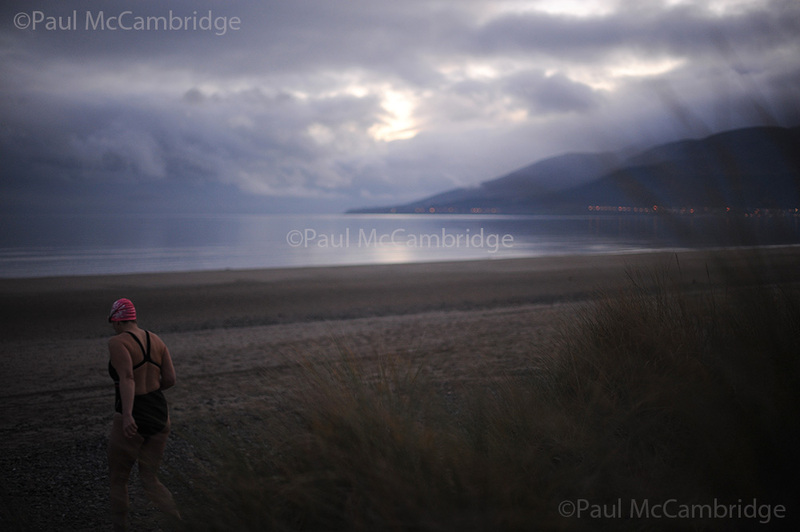 A gentle sigh as the Sea swept across the sand and clouds drifted low on the Mournes in a smoky evening sky as the last few dogs and their walkers left the beach. With the lights beginning to twinkle on in Newcastle I walked to the waters’ edge. Toes numb as sharp pins pricked my calves, my knees felt the pain of cold then my thighs raised in goose-bumps as I walked on, glad there were no waves to shock my still warm and dry upper body. I dipped my hands in, oh the shiver as I gently lifted the water and smoothed it down my arms, more boldly passing it over my shoulders and the back of my neck. I grit my teeth and dipped under, bouncing up again quickly – the air warmer than the chill sea. Again a dip under and this time remaining submerged I took a few strokes, my back tightening in protest against the cold, the skin pulling taut across my muscles, but yet I was able to swim, even the icy cold across my face did not deter. I was glad of the two caps pulled down well over my ears and tight to the rim of my goggles. The seal was good and no water leaked in, yet I could not help but shiver at the thought that some of that icy brine could seep its way under my cap and creep into my ear. I ran from the water and jogged up the beach, my body warmed and I felt revitalized, alive, almost glowing. The ridges of sand were hard underfoot and I kept on my toes, splashing through the shallow puddles left by the low tide, warm now but soon to be swamped by the returning sea. Dressed again I walked back through the dunes as the dim light seeped away.